The 2016 Summer Olympics are officially over. But for two weeks, billions of eyes from around the world watched athletes attempt to break records and bring home the gold. What a perfect opportunity for marketers, no? Many brands jumped on the Olympics bandwagon, leveraging its popularity for their own campaigns. Some of these brands created particularly inspiring campaigns, both to viewers and marketers alike — whether for the emotion they elicit, or for the reminder of exactly how to execute a remarkable ad or marketing campaign. We rounded up the ones that tugged at our heartstrings as viewers, or inspired us to be better marketers. (Sometimes both.) Check out this list of 11 of the best campaigns from the 2016 Summer Games and what made them so great. The Under Armour brand doesn’t just value the success that comes from hard work; it values the hard work and 24/7 dedication that leads to that success. Their emphasis is on self-improvement and self-reliance — which is why they acquired the fitness tracking platform MapMyFitness back in 2014. For the 2012 Summer Olympics, Proctor & Gamble created a campaign called “Thank You, Mom” that showed flashbacks of Olympic athletes from all over the world growing up and practicing their sport with support from their mothers. That same campaign is back again this year, featuring athletes and their mothers from this summer’s Games. This year’s campaign shows athletes’ mothers helping them through times of stress, cheering them along, and supporting them. Notice the clickable link they added to the video that takes viewers to a web page where they can send a personalized thank-you note to their own moms. Take a look … and maybe grab a tissue. Cheering on your country is a lot easier when you’re the one hosting the Olympics, as Great Britain did in London in Summer 2012. With the Games in Brazil this year, Panasonic, a long-time official partner to the British Olympic Association, wanted to help Great Britain keep up the fan-fueled momentum. So in April 2016, they announced a crowdsourced campaign called #Superfans, which invited fans of Team GB to post pictures on social media using the hashtag to encourage engagement. All the fan photos posted with the hashtag #Superfans was posted on a dedicated web page on Team GB’s official site, and Panasonic UK offered extra incentives like Twitter contests. Is it a bird? Is it a plane? No…It’s #Superfans! What makes the Olympic Games so special? The elite athletic competition, yes — but also the bringing together of people and cultures from all over the world. And it’s that second part that the folks at Apple chose to focus on in their Olympics commercial. The ad showcases beautiful photos and videos of people all over the world taken using an iPhone, and it’s set to Maya Angelou reading excerpts from her poem, “Human Family.” What a beautiful message. Not all of us can be Olympic athletes — but the folks at Coca-Cola make the case that even ordinary people like you and me can experience the feeling of winning gold. To do this, they launched the campaign #ThatsGold, which they first integrated into a TV ad (shown below) with the “Taste the Feeling” campaign they launched in January 2016. In addition to the commercial, they set up a fully operational “real-time marketing” global hub in Rio that monitored the #ThatsGold hashtag during the course of the Olympics and created content around key moments in real time on Twitter, Instagram, Snapchat, and more. Virgin Media is all about being fast, advertising their WiFi speed as “fast,” “superfast,” even “ultrafast.” So it comes to no surprise that they chose to pay tribute to Usain Bolt, the fastest man in the world, for their Olympics campaign this year. Bolt set the World Record for the 100-meter sprint at 9.58 seconds at the 2009 Berlin World Championships in Athletics. To demonstrate what 9.58 seconds feels like, Virgin Media created an advertisement that strung together ten, 9.58-second vignettes that each cast light on a different part of Bolt’s life. The purpose? Both to celebrate Bolt’s spectacular accomplishment and to emphasize the importance of speed. Back in March of this year, Airbnb became the first official “alternative accommodations” sponsor of the Olympics — the first time the Olympics has ever had an alternative accommodations sponsor, according to local Olympic officials. Why’d they do it? Mashable reports that when Rio won the Olympic bid in 2009, it had just half the 40,000 beds required for the games — so it was definitely a win for the city, the games, and Airbnb. In exchange for an undisclosed amount to local Olympic organizers, Airbnb was included in the Rio 2016 Olympic Games’ ticketing platform by way of a specific landing page where customers were able to rent private homes and apartments in Rio. They also got a link to their site on the official Olympic website, along with calls-to-action encouraging people traveling to Rio for the Olympics to use the service for rentals. 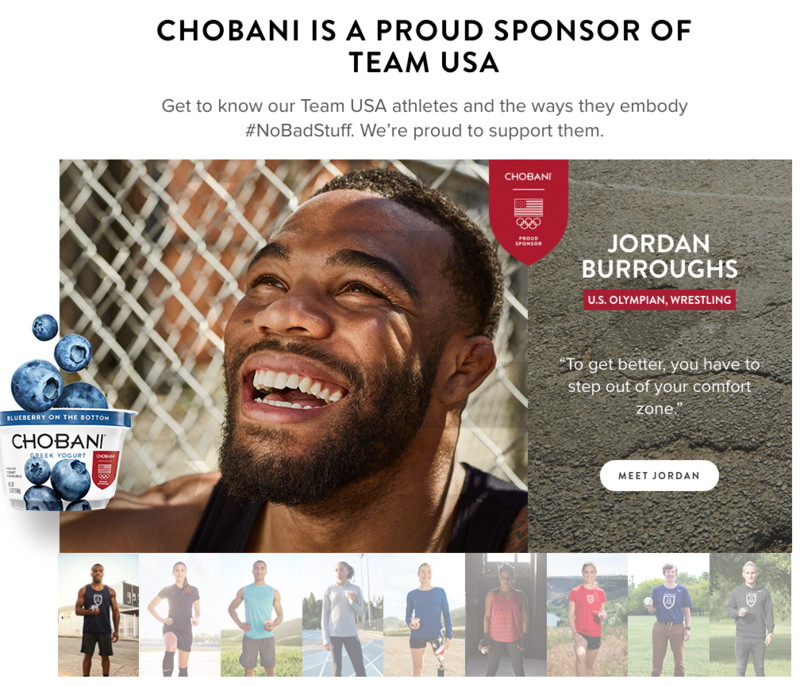 Goodness is a choice you make, claims Chobani with their Olympic-inspired campaign #NoBadStuff. From a literal standpoint, their campaign is about the good, healthy ingredients in Chobani yogurt; metaphorically, it’s all about having a positive attitude, working hard, treating others well, and properly fueling your body. Their campaign also includes a TV ad, content where U.S. athletes give advice on things like how to stay cool under stress, and — my personal favorite — a few limited-edition yogurt flavors inspired by Brazil. Instead of focusing on the athletes, the folks at Folgers used their ad time to focus on the coaches that help those athletes get to where they are. Specifically, it follows the relationship between a boy and the coach that helped him through every win, every loss, every injury, and every moment of glory before he was eventually chosen to represent Team USA. NBC is known for doing a thorough job covering the Olympics, from its online live streams to its TV interviews with medalists. But their roots are deep in old-school media like cable, which isn’t the most well-used and attractive medium for the younger generation. 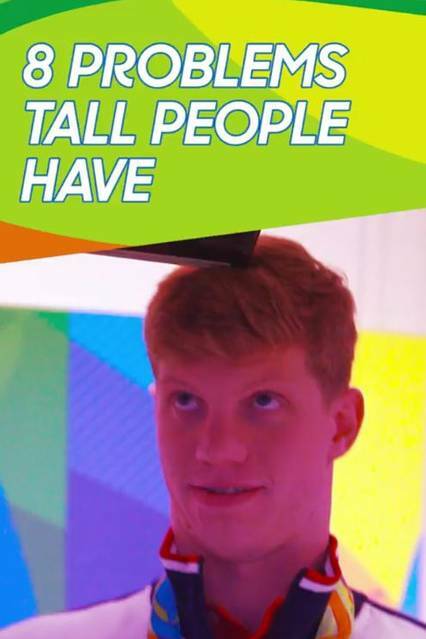 That’s exactly why the folks at NBC decided to partner with BuzzFeed for the Olympics this summer, where they produced special Olympic features and posted them to Instagram, Facebook, Twitter, and Snapchat. The campaign itself has had mixed reviews, with complaints mostly surrounding the brand tapping into the polarized political climate. 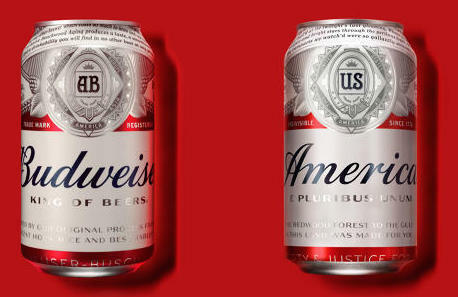 But the campaign did help increase Budweiser’s ad awareness and purchase consideration, at least initially. A week after the campaign began, the company reached its highest purchase consideration level of 2016 (i.e., the number of shoppers 21 and older who said they’d consider Budweiser the next time they bought beer), although that numbers have dropped back down since. There you have it. We hope you found these examples inspiring. What other Olympics campaigns have inspired you, in 2016 or from previous Olympics? Share with us in the comments. Editor’s Note: This post was originally published in August 2012 and has been updated for accuracy and comprehensiveness. Does Your Nonprofit Need Marketing Automation?